I love being able to discover “new” shows that aren’t really new. Purlie first opened on Broadway in 1970 and won several awards, and although I had heard of it before and saw a clip of an old Tony Awards performance on YouTube, I didn’t know much else about the show. Now, thanks the the delightful new production at the Black Rep, it’s almost like I’ve stumbled across a brand new musical. With a tuneful score, vibrant staging and a strong cast, Purlie is a sure crowd-pleaser with a memorable story and an important message. The story, that seems to be set sometime in the early 1960s, follows Purlie Victorious Judson (Kelvin Ralston, Jr.), a preacher who returns from Alabama to his Georgia home on a mission: he’s going to buy back Big Bethel Church for the community by means of a $500 inheritance that’s owed by the tyrannical plantation owner Ol Cap’n Cotchipee (Jim Anthony) to Purlie’s cousin. Purlie has brought home Lutiebelle Gussie Mae Jenkins (Alicia Reve’), who bears a resemblance to the long-lost Cousin Bea, in order to fool the Ol’ Cap’n into paying out the inheritance. With the assistance of Purlie’s brother Gitlow (J. Samuel Davis) and Gitlow’s wife Missy (Kimmie Kidd), Purlie hopes to revive the church and give hope to the African-American cotton pickers (including Gitlow) on Cotchipee’s plantation who have been kept in debt and oppressed by the Ol’ Cap’n for years. Cotchipee’s hippie-ish son, Charlie (Greg Matzker) stands against his father’s racist policies and only wants to sing folk music and try to change the world, or at least his part of it. Meanwhile, confirmed bachelor Purlie is faced with the decision of what to do about his relationship with Lutiebelle, who is in love with him. The story is told in flashback, so we know how it ends before it begins, but that actually helps add to the suspense, making us wonder exactly how the story arrives at its inevitable and celebratory conclusion. The score for this show, by Gary Geld and Peter Udell, is simply wonderful, with memorable songs like the Gospel-styled “Walk Him Up the Stais”, upbeat numbers like “New Fangled Preacher Man”, “The Harder They Fall”, and Lutiebelle’s energetic “I Got Love”. With dynamic choreography by Heather Beal and great singing all around, this production makes the most of the excellent score, although the otherwise great-sounding band is a little bit too loud, drowning out some of the singers especially earlier in the show. With one or two slower songs like the lovely “He Can Do It”, it’s mostly an upbeat score that has the sound of its time (the early 1970’s), although is a lot less dated that some other scores from that era, and very well presented here. There’s also a colorful, multi-unit movable set designed by Dunsi Dai that sets the scene of the crumbling old Southern plantation and surrounding buildings, and colorful costumes by Jennifer (J. C.) Krajicek. Casting-wise, director Ron Himes has assembled a strong group of performers, with the standouts being the vivacious Reve’ as Lutiebelle and the comically gifted Davis as Gitlow. Both of these performers have such strong stage presence, commanding every scene they are in, Reve’ with youthful energy and Davis with mischievous charm. In the central role of Purlie, Roston is also excellent, especially in his scenes with Reve’ and in a hilarious monologue late in the show in which he spins a somewhat fantastical tale. There are also great performances from Kidd as the tough but supportive Missy–who has a fun little dance moment with Lutiebelle during the song “Purlie” in the first act–and Linda Kennedy as Idella, the elderly maid who practically raised Charlie. Anthony is an effective villain, giving the character a veneer of Southern politeness that doesn’t the least bit conceal his self-centered, racist attitudes. As for Charlie, Matzker does an amiable job with some good comic moments, and he sings well on the upbeat, folky “The World Is Coming to a Start”, although he comes across as quite a bit older than the character is meant to be, which is something of a distraction from the otherwise highly entertaining show. Overall, Purlie is an uplifting, memorable musical with an impressive score and an encouraging message of hope and reconciliation. 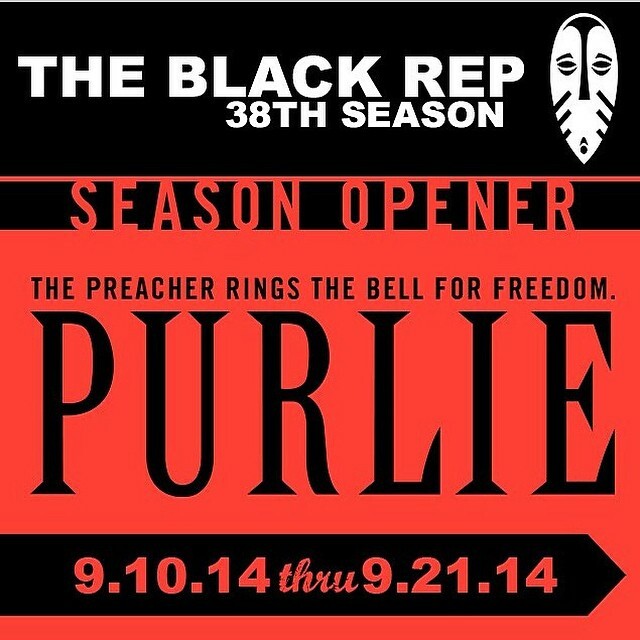 The Black Rep has brought together an extremely talented cast and a vibrantly presented production that should appeal to all ages. I don’t want to sound too cliched, but I really was humming the score on the way out of the theatre. Even despite a few minor flaws, this production is a real delight.